On Election Day this year, I didn’t vote. And I’m not a bit sorry about it. Whoa, whoa, Bill Harlan, put down the cell phone and forget that airplane reservation. You don’t need to break away from your hectic late-fall tennis schedule down in Georgia and fly back to Rapid City and straighten me out, again. I’m still following your 15-year-old directive — and remembering your lecture in the Rapid City Journal newsroom — to do my duty as a citizen, and vote. But this year, rarely enough, I voted early — which for me meant voting at about 3:30 p.m. on the day before Election Day. I had other plans on Election Day, after all. I had to go look at a mule. At least, that’s what I told Tony Venhuizen, chief of staff to Gov. Dennis Daugaard, when I was cruising down Highway 47 on the last leg of the trip from Rapid City to Burke last Tuesday. Well, I didn’t call him just to announce the mule-viewing excursion. I called him for his prediction on the vote in the governor’s race. “I’m going to say Noem by 3 points, 51-48,” Venhuizen said, predicting the outcome exactly. Then he asked if my trip to Burke had something to do with Billie Sutton, who Kristi Noem was to beat later that day in the hotly contested governor’s race. It could have been about Billie Sutton. And in fact, when I found out I’d be in the Burke area on Election Day with my two old pals, Larry Marsh and Tom Clemens, I called Sutton to see if he’d be around, hoping maybe to catch him casting a vote in his home town. But he voted early, too, and was already in Sioux Falls finishing up his campaigning. I was serious. I explained that I was hunting my way to Burke with my springer spaniel, Rosie, where I’d join Clem and Larry and Larry’s son, Justin. Larry lives in Alaska, has a little piece of land and some alfalfa fields, some farm equipment and some horses for excursions up into the mountains. But he really likes mules for tricky trails in the high country. 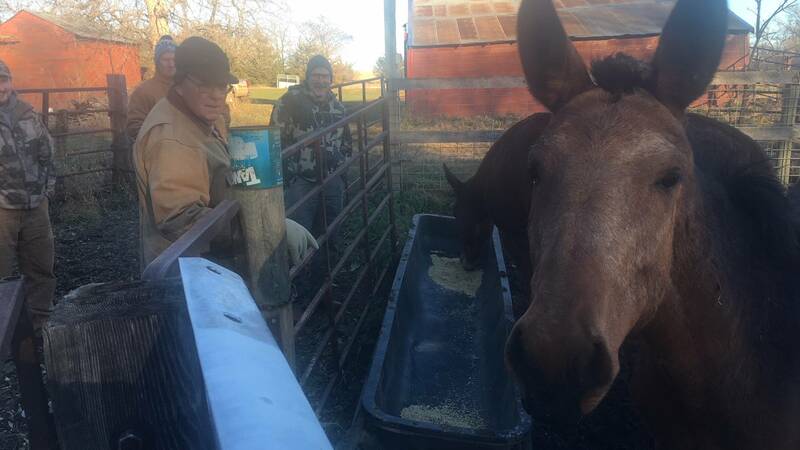 And Larry’s mule died a while back, so his interest in mules has intensified. And since he was coming home from Alaska to spend 10 days or so with his dad in Reliance, he was looking for interesting day trips in central South Dakota. He found one near Burke at the Dave Steffen ranch, where the mule lives. Actually, it’s the mules. More on them in a minute. For now, back to Venhuizen. It was an old-man kind of thing, I suppose. Old men get interested in things that young men might find find puzzling. But despite his youth, Venhuizen listened as patiently as he could. And I could have argued that there was a bit of a political connection at work, too, of course. The donkey is the symbol of the Democratic Party. And the mule is a product of a romantic union — or perhaps just a pragmatic one — between a horse and a donkey. As the story is popularly told, the donkey came to the Democratic Party way back in 1828 when Democrat Andrew Jackson was running for president and his opponent referred to him as a jackass — a relatively harmless pejorative compared to those used in today’s campaigns. And, in fact, Jackson took it as sort of compliment to his strong will, using it in his own campaign. Later it became fodder for a popular cartoonist of the time. And the donkey stuck. But back to the mule-viewing trip down into Billie Sutton’s home country. I’ve been to the Sutton ranch above the Missouri River northeast of Burke. But on Election Day we were headed southwest of town, to the little ranch of a guy who’s something of a rarity in most of western South Dakota: a rancher who happens to be a Democratic. Dave Steffen also happens to be a retired Natural Resources Conservation Service soil specialist, and his ranch is a testament to soil conservation and native-grass restoration and management. He also has prairie chickens and sharp-tailed grouse on those grasslands, and an awfully good dam for bass and bluegill fishing. I fished there a couple of years ago, and might be going back this winter for some ice fishing. But on Election Day, we were angling for a look at the mules, Duke and Daisy. They came loping into the corral from a small, fenced patch of adjoining pasture when Steffen rattled the bucket. And have to say, Daisy took a shine to me right away. I’d like to think she recognized stubbornness when she saw it, having some herself. A younger man — or maybe even an old man with a different perspective on things — might have considered it a ridiculously long trip just to wander around in a chilly northwest wind considering a couple of mules. And it’s not even like we were on a shopping trip, so Larry could take a mule back home. Neither Duke nor Daisy was for sale. “Really, I just came down to see them,” Larry said. That was good enough for me, and for Clem. Justin seemed OK with it, too, despite his youth. It was also an old-friend trip, of the kind Larry and Clem and I used to take together long before we got old. Those trips didn’t always make sense, either. But we always had fun. This time was no different. We gathered in Reliance at the home of Larry’s 94-year-old dad, Leonard, who is known to everyone thereabouts as “Granny,” a name he earned in his youth through protective behavior toward his younger siblings. After a cup of tea and catch-up there, we headed for Burke and the mules, traveling through the familiar Lyman County landscape of our youth. Harry Truman might have seen the value of the trip beyond old-man idiosyncrasies. Truman loved mules, after all, and not just because the mule was his party’s symbol. Dave Steffen’s mules were not working while we were there. But they were eating — oats, thanks to Steffen and his grain bucket. And they seemed about as happy to see us as we were to see them. The extended conflab at the corral seemed to be enough for all of us. We didn’t ride the mules. We didn’t pet the mules. We didn’t make an offer to buy the mules. We just stood around and looked at the mules, talking about them in a complimentary way as they munched oats and pondered us in return. But it wasn’t just a mule trip. We also had a look at Steffen’s native grasses. And we sat for a couple of hours among the waders and fly-tying gear and other outdoor paraphernalia in his “man shed,” discussing the principles of range management, the peculiarities of politics and his plans to improve the fishing pond and make it more accessible to the public. Then Larry and Justin headed back to Reliance, Clem went on to Sioux Falls and I loaded up Rosie and took off for Rapid City, feeling like I had the perfect Election Day, in an old-man sort of way. Still, I resisted the urge to call Venhuizen and give him a full report. Even an old man has some sense.